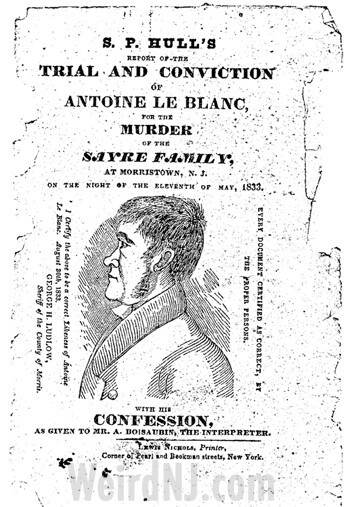 After being tried, convicted and executed for the triple murder of one of Morristown’s most respected families, the story of Antoine Le Blanc should have been over. But his public hanging on the town green was really just the beginning of a tale so gruesome that Morristonians still recoil at its telling one hundred and sixty years after the incident. For it is said that the remains of Antoine Le Blanc may rest in pieces, to this day, amongst the treasured family heirlooms in some of the finest homes of New Jersey. Le Blanc, a French immigrant by way of Germany, arrived in New York in April of 1833. After three days in the New World, he was hired as a hand to work the family farm of Samuel Sayre of Morristown, N.J. In exchange for his hog slopping and wood chopping labors, Le Blanc was afforded a small room in the dank basement of the Sayre house–but no wages. He took his work orders from Mr. Sayre, his wife Sarah, and even the Sayre’s household servant Phoebe, who is believed to have been a slave. Being the privileged son of a well-to-do European family, this arrangement probably did not sit too well with the thirty-one year old Le Blanc. It was about two weeks after he first started his menial chores on the Sayre farm that Le Blanc decided that he could suffer the indignity no longer. He began to plan his revenge. On the night of May 11, Le Blanc returned to the Sayre house at about 10:30pm, after drinking at a local tavern. Faking distress, he summoned Samuel Sayre out to the stable, where he said that there was a problem with the horses. Carrying a candle, Mr. Sayre made his way out to the barn, where Le Blanc proceeded to smash in his employer’s face with a shovel, splattering pieces of Sayre’s brain all over his coat. The killer then repeated his ploy on Mrs. Sayre, finishing her off with a kick to the head from one of his heavy boots. After hiding the two bodies beneath the nearby pile of manure, Le Blanc made his way back to the main house, where he found Phoebe asleep in her bedroom on the second floor. Le Blanc then caved in the unsuspecting girl’s skull with a single blow from a club. After his murderous spree Le Blanc frantically stuffed whatever household valuables he could into pillowcases and set off down the road on one of the Sayre’s horses. In his haste to escape the scene of the crime, he unknowingly left a trail of stolen booty in the roadway that would later mark his route. On the morning that followed, Lewis Halsey, a Sayre family friend, discovered some personal effects in the road which bore the monogram of Samuel Sayre. Fearing a robbery had taken place, a group of townsfolk decided to search the Sayre property. After the grisly discovery of the three murdered victims, Sheriff George Ludlow set off in pursuit of the killer. When he caught up with him, Le Blanc was sipping cider in the Mosquito Tavern in the Hackensack Meadows, a pouch of Sayre’s possessions by his side. According to his subsequent jail cell confession, Le Blanc had stopped to rest en route to New York, where he planned to board a ship bound for Germany. Upon spotting Sheriff Ludlow, Le Blanc bolted for the back door of the tavern, but was easily apprehended and transported back to Morristown for prosecution. On the afternoon of September 6th, Le Blanc stood atop the “modern” gallows erected on the village green for the occasion. This new device was designed to jerk the condemned man upward, rather than drop the floor out from beneath him like a conventional gallows. 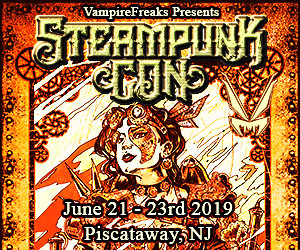 A crowd, estimated at between ten and twelve thousand, had descended upon Morristown, greatly outnumbering the local population, which was about 2,500 at the time. The jeering mob, many of whom carried bag lunches, made their way into tall trees and onto nearby rooftops to get a better view of the execution. When the counterweight dropped, Le Blanc shot up in the air about eight feet. His body twitched for about two minutes at the end of the rope, and then was still. Just over four months after first setting foot on American soil, Antoine Le Blanc’s life was ended. But the truly barbaric story that still haunts Morristown to this day was just about to begin. It seems the good, God-fearing Presbyterian townsfolk were not content to let this murderous scoundrel get off so easy with just a mere hanging. They had some other, more creative ideas of what to do with this monster. First, Le Blanc’s lifeless body was cut down from he gallows and whisked across the street to Dr. Canfield’s office. Then, doctors Canfield and Joseph Henry conducted some rather unorthodox medical experiments, using Le Blanc as their unwitting lab rat. 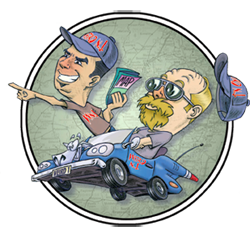 Hooking the corpse up to a primitive battery, the doctors endeavored to prove a prevailing theory of the time, which linked electrical current and muscular motor impulses. Although unable to resurrect the dead man, the scientists reportedly got Le Blanc’s eyes to roll around in his head, caused his limbs to tense somewhat, and even elicited a slight grin from his dead lips. Frankenstein’s monster though, he was not. After the good doctors had completed their efforts to advance medical science, a death mask likeness of Le Blanc’s face was cast in plaster. Then it was time to carve him up. Le Blanc’s skin was peeled off and dispatched to the Atno Tannery on Washington Street to be fashioned into a variety of “charming little keepsakes.” A large number of wallets, purses, lampshades and book jackets were produced from the hair follicle studded hide. Strips of skin were sold on the streets, each one personally signed by the honorable Sheriff Ludlow to verify its authenticity. These gruesome little souvenirs reportedly found their way into many a respectable Morristown home, where, it is said, many still remain to this day. As the years passed most of the residents of Morristown seemed content to let this dark episode of local justice slip quietly between the pages of the town’s history. The story of Antoine Le Blanc, however, proved to be harder to kill than the man himself. Rumors concerning the whereabouts of Le Blanc’s remains continued to circulate around the area long after the 1833 dissection. One such local legend was that Dr. Canfield had reassembled the executed man’s skeleton to hang in his office. This myth was disproved, however, in 1893, when workers building an addition to the county clerk’s office found Le Blanc’s missing bones in a small wooden box in the bowels of the old building. 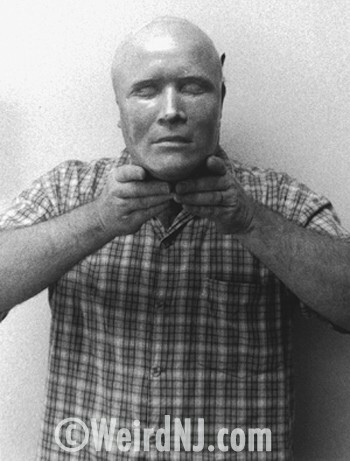 Then, on Halloween night 1995, a startling discovery was made which confirmed many of the long standing rumors concerning the survival of Antoine Le Blanc’s epidermal artifacts in Morristown. 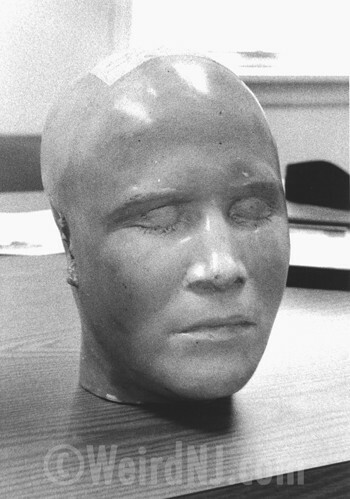 While liquidating the estate of the late Carl Scherzer, workers from Dawson’s Auctioneers and Appraisers of Morris Plains uncovered the glazed plaster death mask of Antoine Le Blanc stashed away in a box in Scherzer’s basement. Soon after this grim discovery, a shriveled change purse made from what appeared to be human skin was found tucked away in an upstairs library of the same house. Scherzer, a retired surveyor and unofficial town historian, had evidently amassed quite a collection of nineteenth century artifacts during his lifetime. After his death in 1979, the chore of sorting through his museum-like house fell upon the shoulders of his son Douglas, who in turn called Dawson’s. The death mask of Antoine Le Blanc, along with the skin accessories, were put on display in a glass case at Dawson’s, but were not offered for bidding to the packed house at the November 18th auction. After the display was dismantled, the Le Blanc trinkets were returned to the custody of the surviving Scherzer. Then Chief Scherzer removed the remaining contents of the box. He pulled out a dusty old eight by ten picture frame that contaianed a small rectangular wallet. It was about four and a half inches long, and a sickly greenish-brown in color. It folded over, and a tongue flap fit neatly into a slot on top to close it. I had never seen anything like it before. This was not the tough, yet supple hide of a cow or pig, which we are all familiar with. Nor was it the shiny, rough and scaly skin of a reptile. This was a thin and frail skin that should never have been tooled in such a manner. This skin was cracked and withered. This was the desiccated flesh of a human being it was an inscription typed on a strip of paper that read, “A wallet made of human skin allegedly that of Antoine Le Blanc.” And so, it would seem, that reminders of this macabre episode in New Jersey history will continue to find their way into the consciousness of Morristownians. But what has become of the dozens of remaining souvenirs which were culled from the tanned hide of Antoine Le Blanc? We don’t know. But don’t be surprised if you bump elbows with a Weird NJ reporter the next time you’re out canvassing garage sales in the Morristown area. 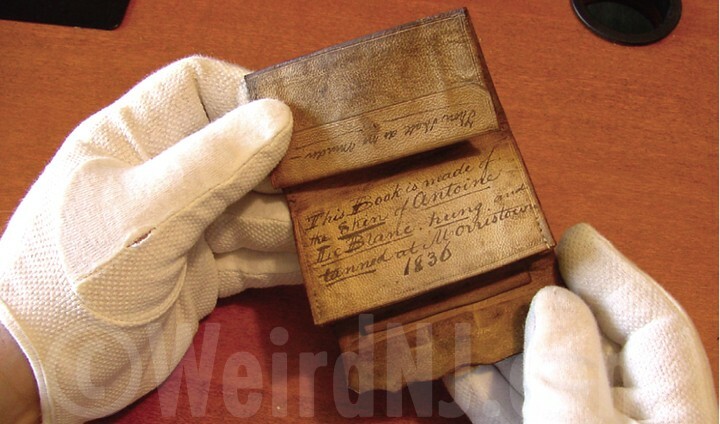 For Antoine Le Blanc will undoubtedly rest in pieces scattered throughout that town for some time to come, and an old wallet, once a genuine hide, could turn out to be a real weird find. 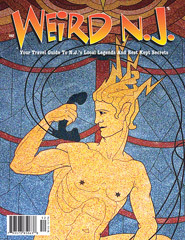 This story is excerpt, for the full story see our book Weird NJ: Your Travel Guide to New Jersey’s Local Legends and Best Kept Secrets. This entry was posted in Local Heroes and Villains, Mystery History, Stories and tagged Antoine LeBlanc, hanging, human skin wallets, Morristown, Murderer, public execution, skinned killer. Bookmark the permalink.